There are a lot of problems with our existing food production system. Consider: the average mouthful of food of Americans has travelled 1,500 miles before reaching our plate, losing nutrition and flavour while consuming an incredible amount of energy. The quality of much of our food – and the waste of energy ask for change. Why not growing food where people live? ‘Green building’ could help in many ways: from energy efficiency and water conservation to salvaged materials, healthier living, and reduced automobile dependence. We could produce healthier food closer to home-even in urban and suburban areas. Many people can garden their backyards as your great-grandparents did with their Victory Gardens during World War II, when up to 40% of the vegetables in the USA were home-grown. In cities people can work together as communities to create productive gardens out of abandoned and unused vacant lots – often up to 15% of our urban landscapes. If the soil is contaminated it is possible to use a layer of clay to isolate that contaminated substrate and bring a rich, compost-based soil for growing crops on top of that. Other strategies for local food production are much newer, higher-tech, and less familiar. Many modern buildings have a flat roof, in the USA 4.8 million commercial buildings have about 1,400 square miles of nearly flat roof—an area the size of Rhode Island. On those roofs with adequate structural support and good solar exposure, green roofs or rooftop greenhouses can be constructed and planted with edible crops. Greenhouses on top of roofs growing hydroponic produce can achieve greater yields than soil-based greenhouses, yet with far less weight. This can even be combines with fish production, such that the waste from the fish fertilize the plants-providing an integrated, balanced system in which the only inputs are fish food, sunlight, and enough water to replace that which evaporates. Along with keeping us comfortable and healthy, emitting no net carbon emissions, and minimizing other environmental impacts, green buildings of the future can also help to nourish us. In an increasingly urbanized world, our buildings and the landscapes around them should become a part of our agricultural system. 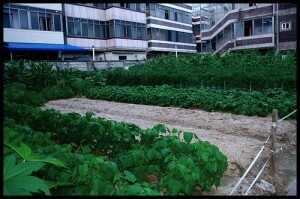 Read the article growing food locally in the city. Most food has used a lot more energy before you eat it, than it gives your body. How is this energy being used? What is ‘hydroponic’? Find out if you do not know. Why is hydroponic better for growing vegetables on roofs? Why is hydroponic not (yet) much used in organic farming? Growing food in empty lots and on roofs also makes living in the city healthier. Why is that? a. Are there flat roofs in your area that could be used for growing food? d. Perhaps you can start somewhere a rooftop garden! e. Are there empty lots in your area that could be used for growing food? f. Are there already places where food is being grown in your area? h. Perhaps you can start a urban garden or ‘farm’ with your class, together with other people. i. – and why not in your schoolyard? j. If you live in a place where people have gardens: are there some or many gardens with vegetables of fruit growing? l. Perhaps you can start a fruit or vegetable garden in your own yard, start a competition with a small group: who can provide the family’s vegetables for a whole week before the end of the summer? n. But also when it was not war people grew their own food. Interview some old people about the kitchen gardens in their youth and/or visit a place where you can study the garden heritage of your country or region.